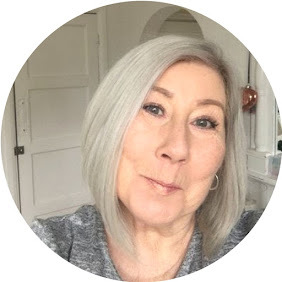 As promised in the last post about Studio 10 which you can read here I am continuing with my exploration of this fabulous brand that it specifically designed for mature skin. This time I have been trying out Visible Lift Face Definer & Age Defy Skin Perfector. Again in the stylish mirrored compact design these two palettes are designed to bring out the very best in mature skin. The Palette contains 5 pans of various sizes, which in itself is perfect, you obviously use more of some products than others so this provides the amounts in the way you would naturally use them, therefore there is no wastage. The first and largest pan is the skin primer which diminishes the look of open pores and fine lines, I couldn't imagine doing any kind of make up without a primer it just gives you that smooth perfect base, next are 2 concealers in 2 shades they blend perfectly with the Age Repair Perfect Canvas and finally you have a green corrector for diminishing any signs of redness, perfect for any little broken capillaries, and secondly the peach corrector which brightens dark areas, typically under eyes and the sides of the nostrils, I have found that with using just this little palette alone I can have no make up days still looking as though I have made an effort but with a totally minimal look, and only I know that I have hidden the naughty bits ! I have to say that in my opinion this is nothing less than perfection for mature skins, we have all seen contouring pictures and videos and maybe even tried it, with limited success, as make up artists make it look so easy, to be honest when I have tried to follow the full contour tutorials |I end up just looking muddy with no definition at all ! I also think that this type of contouring is easier on younger firmer skin. What Studio 10 have done is produce the easiest, subtle palette ever for mature skin, it is impossible to go wrong with this one, a beautifully subtle contour, which does just that ! suddenly you have the cheekbones you had forgotten about, a highlighter that is not totally bling, it highlights rather than make you look like a Sci Fi film extra, and just brings you that perfect * hit with light * look that highlighting is all about, and finally a beautifully soft creamy blush that just delivers a youthful glow for a fresh faced look. I have to say this really is a little gem of a product and one that I can't imagine now being without, it also eliminates the need for separate products which can be a pain especially when travelling. Please keep an eye on the Blog for more Studio 10 make up coming up soon.......the love affair continues !